In a move that was widely predicted, Twitter has opened the door to making money by placing advertising on users' tweets. 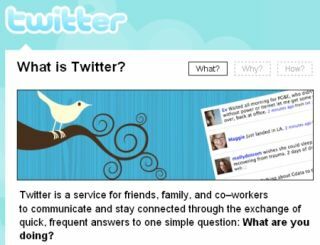 The microblogging site's co-founder Biz Stone wrote of the move on the company's official blog earlier this week when he described the reason for changes to Twitter's terms of service. "In consideration for Twitter granting you access to and use of the services, you agree that Twitter and its third-party providers and partners may place such advertising on the services." Without specifying the placement of any future ads, Stone said: "We leave the door open for advertising. We'd like to keep our options open, as we've said before." If advertisers are happy to risk placing their products alongside the unpredictable user-generated content that forms the core of Twitter, then opening up access to the site's 40 million-plus monthly visitors could prove very lucrative indeed.